The national land summit that the South African Communist Party (SACP) called for in its 2004 Red October campaign took place at the end of July 2005. Provincial land summits ostensibly prepared the ground to stage the July land indaba, just as the SACP had requested government to do. Since the SACPs intention was to “accelerate land reform,” it is natural to assess the impact of these land summits on struggles for agrarian reform. What are the chances that the set of recommendations that the land indaba produced will be implemented? The national and provincial departments of agriculture, actively promoting a neo-liberal large-scale farmer model, took charge of preparing for the summit. The division within the Ministry of Agriculture and Land Affairs responsible for land reform policy and implementation played a minimal role in the entire process. From this evidence, things did not go according to the SACP’s wish to have NEDLAC — the so-called neutral forum of the government, bosses, and workers — in charge of these land summits. 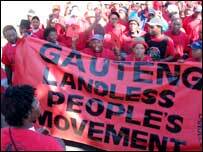 There were also no “peoples’ land tribunals or mass assemblies of the landless” before or on the days of the summit. Provincial land summits seem to have been dominated by affiliates of the big commercial farmers’ associations and land reform NGOs. At several of the provincial summits, groups of landless and poor small farmers staged a variety of protests, like the “walkout at the Western Cape land summit.” At the national land indaba, academics, a few NGOs, and high-level government officials dominated proceedings. The SACP and 15 of the NGOs participated in the land indaba under the banner of the Alliance of Land and Agrarian Reform Movements (ALARM). ALARM issued a common list of demands. But in the spirit of “united front” action, each ALARM constituent made its own submission during the slot allocated to it on the first day of the land summit. Submissions to the land summit, including those by some big commercial farmer groups (like AgriSA), essentially reiterated and endorsed the case for land reform. This was significant when seen against the background of anti-land reform research published before the summit by neo-liberal theorists from the apartheid era. This research basically argued that allocating ownership titles to urban housing is the best response to the unstoppable migration from the countryside. Around the same time, reputable researchers at the Human Sciences Research Council (HSRC) released some preliminary findings that contradict the “urban housing titling response to the land question.” According to the HSRC study, at least 1 million households in three provinces (Limpopo, Free State, and Eastern Cape) demand small plots for non-commercial farming. Indeed a survey of “land hunger” that includes provinces with larger numbers of people living in rural areas will put land need for small-scale farming much higher. While almost everyone at the summit accepted the need for land reform, there was intense disagreement on the best “model of land reform.” Those who favored the “market-based approach” or the willing seller willing buyer model — including the World Bank, the state, some tribal leaders and commercial farmers — formed the minority. For the main recommendation was an outright rejection of this framework and a call on the state to review its approach that has resulted in “11 years of broken promises.” It remains to be seen what actions the state will take on some recommendations, like reopening the land claims process, stopping illegal evictions of farm workers, expropriating obstructive land owners, and so on. Demands that ALARM publicized before the indaba, like “ceilings on the size and number of privately owned farms,” “a moratorium on the sale of arable land for game parks and other recreational activities,” and an “end to privatization of land natural resources” never made it into the final recommendations. Nevertheless, a moderate review of the shameless expansion of land uses for the pleasures of the rich (like game parks and golf courses) seem to have won verbal support from President Thabo Mbeki, himself an avid golf player. This puts the state on the horns of a dilemma. How, then, can land be still used for government’s promotion of these lucrative tourism ventures, which is profitable for a few investors, at the expense of the agrarian demands of the landless poor? The summit once again exposed the conflict between government’s pro-market policies and the fundamental needs of the working class and landless peasantry. In the absence of militant and independent mass formations of the landless poor, the land summit will go down in our history as just another talk-shop that paid lip service to “pro-poor land and agrarian reform.” ALARM, at its first post-summit assessment meeting, resolved to ensure that the state implements the “land indaba resolutions.” In the next few months it will organize provincial assemblies of the landless to inform communities of the outcomes of the summit and plan how to take the fight for land forward. Peter T. Jacobs is an economist at University of the Western Cape. BC Teachers Go Back to Work — Who Won the Battle?